Cookbook/Source : America's Best Recipes Comfort Food or you can find it online here! Notes : We substituted tilapia for flounder and I ditched the 1/2 cup of butter by using only 2 tablespoons (any more would have been crazy). My mom gave me this cookbook for Christmas and so far both recipes we've tried from it have been really good! Review : What a great way to cook fish! It's flaky, tasty and the perfect balance of flavors. Brian tried a bite and was able to immediately name all the ingredients -- nothing competes, it all blends together well. 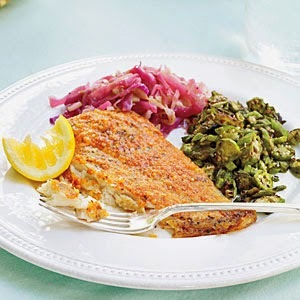 This will definitely become a go-to recipe for white-fleshed fish in our house!